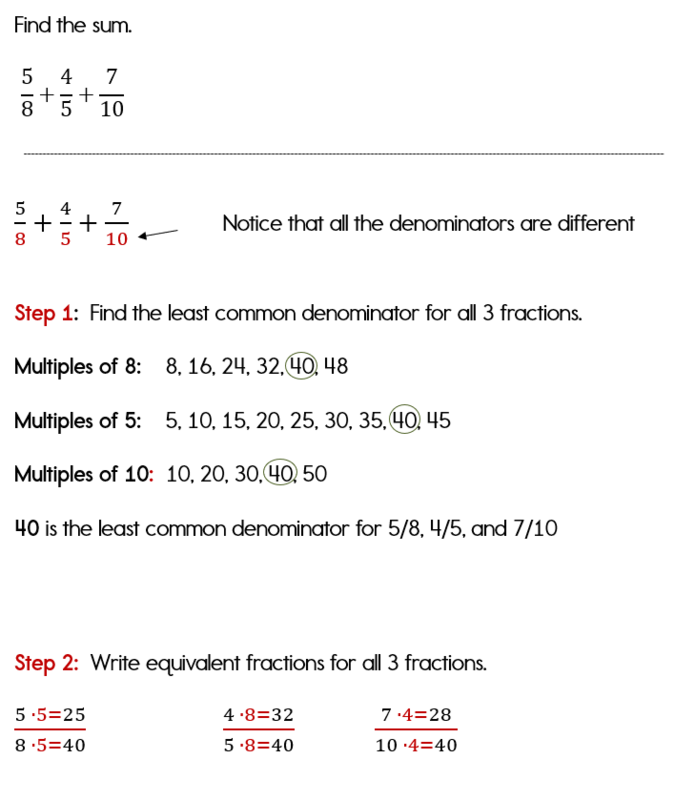 Many people have difficulty adding fractions with unlike denominators. There's no doubt that fractions are difficult to deal with especially when you have to find the least common denominator. I'm going to show you three examples, and I will break down each step for you. 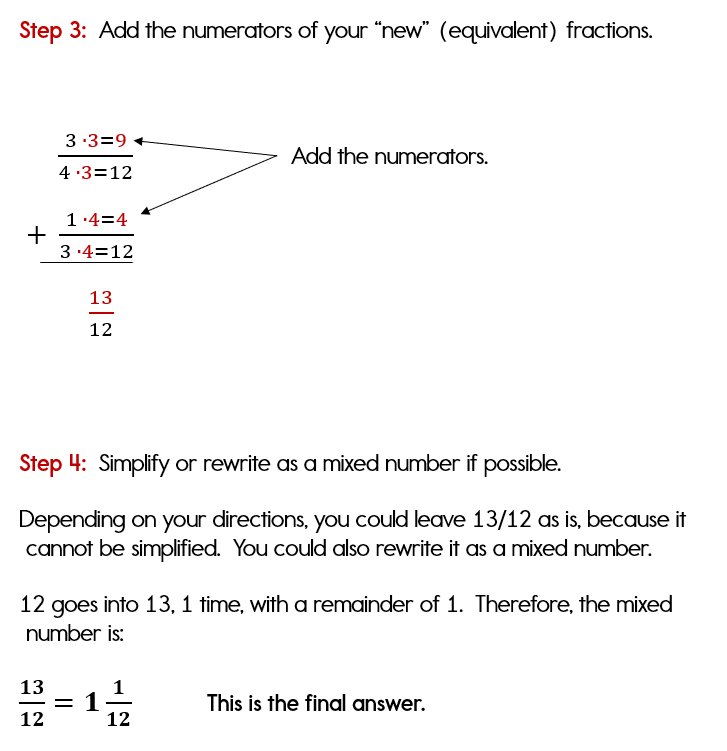 By following my examples, step by step, you will quickly learn how to add fractions with unlike denominators. If you are really struggling, be sure to check out the video examples. 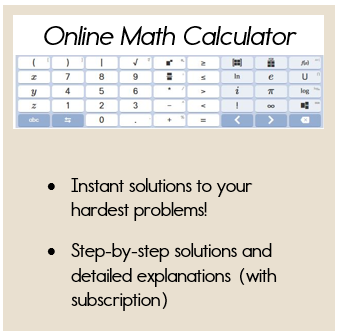 In order to be successful with this lesson, you must be comfortable with finding the least common multiple and writing equivalent fractions. Please go back and review these lessons if you are not proficient with these two skills. OK.. Here we go with Example 1. 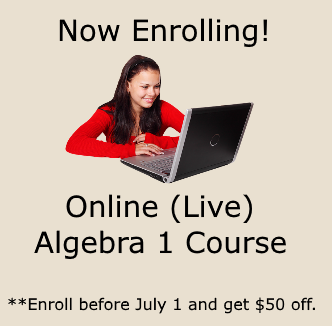 We'll start with the video lesson and the written lesson will follow. 1. 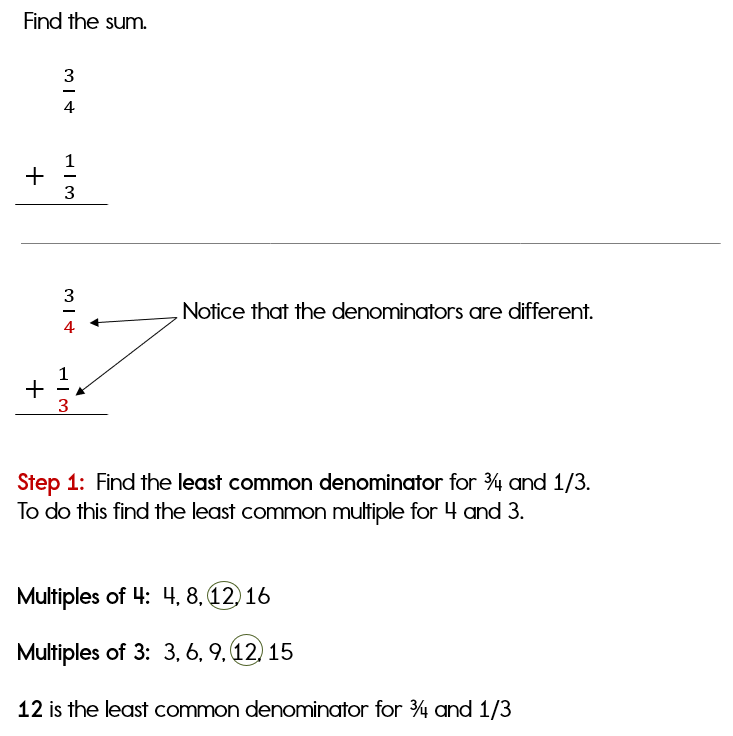 Identify the least common denominator by finding the least common multiple for the denominators. Example 1 was written horizontally, which I'm finding more people are doing lately. I still favor adding fractions that are written vertically which you will see in Example 2. Having trouble? Watch this example on video. 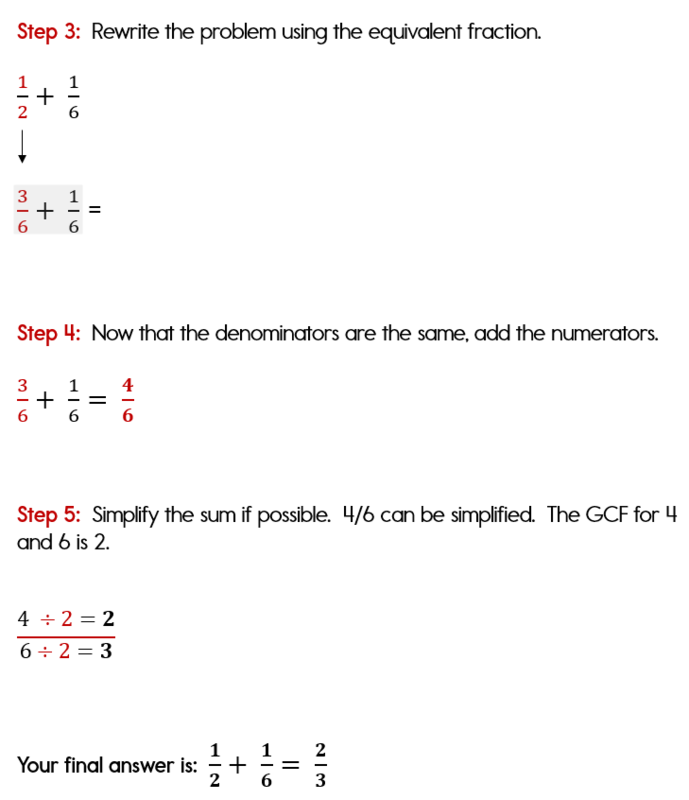 These lessons focus on finding the least common denominator because this will make simplifying at the end much easier. If you cannot figure out the "least common denominator", you can use any common denominator; however you will have to simplify at the end. 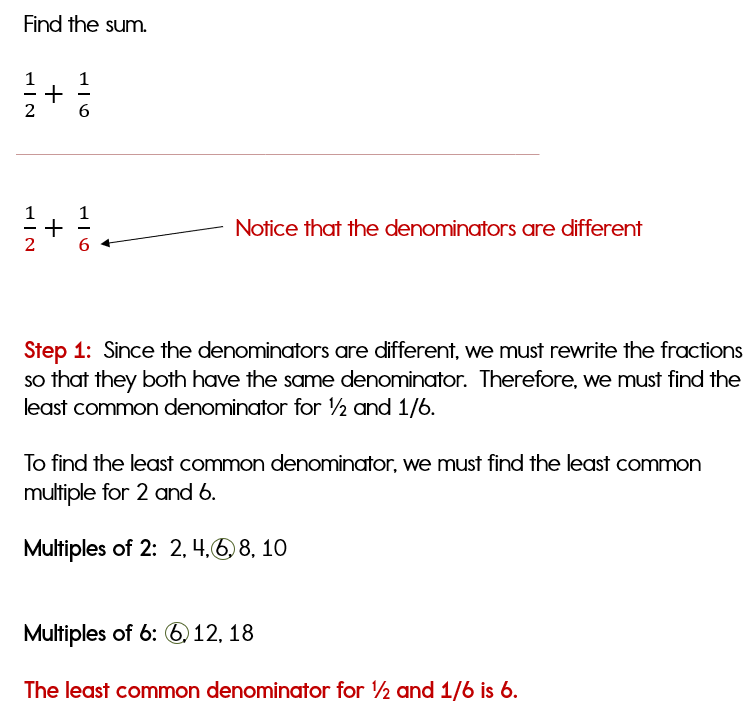 Hint: You can always find a common denominator by multiplying the denominators together. I do recommend finding the least common denominator if possible, but don't fret if you can't! You will still be able to complete the problem. Ok,let's step it up a little. For the last example, we will add 3 fractions. 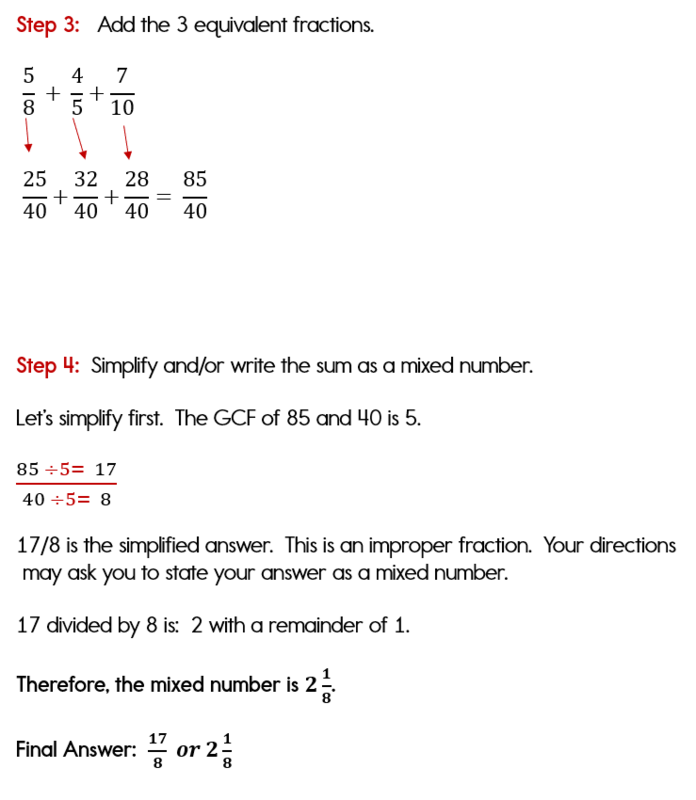 Do you feel a little better about adding fractions with unlike denominators? I hope so! If you are feeling pretty good, then the great news is that if you can add fractions, then you can also subtract fractions. The same process is used, you will only subtract the numerators instead of adding the numerators. Your next faction lesson is Subtracting Fractions with Unlike Denominators.